"Secret speech" redirects here. For other uses, see Secret speech (disambiguation). 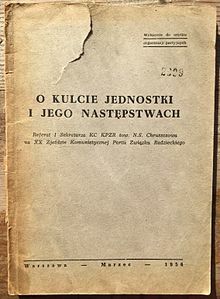 O kulcie jednostki i jego następstwach, Warsaw, March 1956, first edition of the Secret Speech, published for the inner use in the PUWP. The CIA Director Allen Dulles remembered: "the speech, never published in the U.S.S.R., was of great importance for the Free World. Eventually the text was found — but many miles from Moscow, where it had been delivered. (…) I have always viewed this as one of the major coups of my tour of duty in intelligence.". "On the Cult of Personality and Its Consequences" (Russian: «О культе личности и его последствиях», «O kul'te lichnosti i yego posledstviyakh») was a report by Soviet leader Nikita Khrushchev, First Secretary of the Communist Party of the Soviet Union, made to the 20th Congress of the Communist Party of the Soviet Union on 25 February 1956. Khrushchev's speech was sharply critical of the reign of the deceased General Secretary and Premier Joseph Stalin, particularly with respect to the purges which had especially marked the last years of the 1930s. Khrushchev charged Stalin with having fostered a leadership cult of personality despite ostensibly maintaining support for the ideals of communism. The speech was shocking in its day. There are reports that the audience reacted with applause and laughter at several points. There are also reports that some of those present suffered heart attacks, and others later committed suicide, due to shock at the revelations of Stalin’s use of terror. The ensuing confusion among many Soviet citizens, bred on the panegyrics and permanent praise of the "genius" of Stalin, was especially apparent in Georgia, Stalin's homeland, where the days of protests and rioting ended with the Soviet army crackdown on 9 March 1956. In the West, the speech politically devastated the organised left; the Communist Party USA alone lost more than 30,000 members within weeks of its publication. The speech was a major cause of the Sino-Soviet split, in which China (under Chairman Mao Zedong) and Albania (under First Secretary Enver Hoxha) condemned Khrushchev as a revisionist. In response, they formed the anti-revisionist movement, criticizing the post-Stalin leadership of the Communist Party of the Soviet Union for allegedly deviating from the path of Lenin and Stalin. The speech was a milestone in the "Khrushchev Thaw". As a whole, the speech was an attempt to draw the Soviet Communist Party closer to Leninism and away from Stalinism. However, it possibly served Khrushchev's ulterior motives to legitimize and consolidate his control of the Soviet Union's Communist Party and Government, after political struggles with Georgy Malenkov and firm Stalin loyalists such as Vyacheslav Molotov, who were involved to varying degrees in the purges. The Khrushchev report was known as the "Secret Speech" because it was delivered at an unpublicized closed session of Communist Party delegates, with guests and members of the press excluded. The text of the Khrushchev report was widely discussed in party cells in early March, often with the participation of non-party members; however, the official Russian text was openly published only in 1989 during the glasnost campaign of the Soviet leader Mikhail Gorbachev. The issue of mass repressions was recognized before the speech. The speech itself was prepared based on the results of a special party commission (chairman Pyotr Pospelov, P. T. Komarov, Averky Aristov, and Nikolay Shvernik), known as the Pospelov Commission, arranged at the session of the Presidium of the Party Central Committee on 31 January 1955. The direct goal of the commission was to investigate the repressions of the delegates of the 17th Congress, in 1934, of the Communist Party of the Soviet Union. The 17th Congress was selected for investigations because it was known as "the Congress of Victors" in the country of "victorious socialism", and therefore the enormous number of "enemies" among the participants demanded explanation. This commission presented evidence that during 1937–38 (the peak of the period known as the Great Purge) over one and a half million individuals were arrested for "anti-Soviet activities", of whom over 680,500 were executed. The public session of the 20th Congress had come to a formal end on 24 February 1956 when word was spread to delegates to return to the Great Hall of the Kremlin for an additional "closed session", to which journalists, guests, and delegates from "fraternal parties" from outside the USSR were not invited. Special passes were issued to those eligible to participate, with an additional 100 former Party members, recently released from the Soviet prison camp network, added to the assembly to add moral effect. Premier Nikolai Bulganin, chairman of the Soviet Council of Ministers and then an ally of Khrushchev, called the session to order and immediately yielded the floor to Khrushchev, who began his speech shortly after midnight. For the next four hours Khrushchev delivered the "On the Cult of Personality and Its Consequences" speech before stunned delegates. Several people became ill during the tense report and had to be removed from the hall. Khrushchev read from a prepared report and no stenographic record of the closed session was kept. No questions or debate followed Khrushchev's presentation and delegates left the hall in a state of acute disorientation. That same evening the delegates of foreign Communist parties were called to the Kremlin and given the opportunity to read the prepared text of the Khrushchev speech, which was treated as a top secret state document. On 1 March, the text of the Khrushchev speech was distributed in printed form to senior Central Committee functionaries. This was followed on 5 March by a reduction of the document's secrecy classification from "Top Secret" to "Not For Publication." The Party Central Committee ordered the reading of Khrushchev's Report at all gatherings of Communist and Komsomol local units, with non-Party activists invited to attend the proceedings. The "Secret Speech" was therefore publicly read at literally thousands of meetings, making the colloquial name of the report something of a misnomer. Nevertheless, the full text was not officially published in the Soviet press until 1989. Shortly after the conclusion of the speech, reports of its having taken place and its general content were conveyed to the West by Reuters journalist John Rettie, who had been informed of the event a few hours before he was due to leave for Stockholm; it was therefore reported in the Western media in early March. Rettie believed the information came from Khrushchev himself via an intermediary. However, the text of the speech was only slowly disclosed in the Eastern European countries. It was never disclosed to Western communist party members by the nomenklatura, and most Western communists only became aware of the details of the text after the New York Times (5 June 1956), Le Monde (6 June 1956) and The Observer (10 June 1956) published versions of the full text. The content of the speech reached the west through a circuitous route. A few copies of the speech were sent by order of the Soviet Politburo to leaders of the Eastern Bloc countries. Shortly after the speech had been disseminated, a Jewish Polish journalist, Wiktor Grajewski, visited his girlfriend, Łucja Baranowska, who worked as a junior secretary in the office of the first secretary of the Polish Communist Party, Edward Ochab. On her desk was a thick booklet with a red binding, with the words: "The 20th Party Congress, the speech of Comrade Khrushchev." Grajewski had heard rumors of the speech and, as a journalist, was interested in reading it. Baranowska allowed him to take the document home to read. As it happened, Grajewski was a Polish Jew who had made a recent trip to Israel to visit his sick father and decided to emigrate there. After he read the speech, he decided to take it to the Israeli Embassy and gave it to Yaakov Barmor who had helped Grajewski make his trip. Barmor was a Shin Bet representative; he photographed the document and sent the photographs to Israel. By the afternoon of 13 April 1956, the Shin Bet in Israel received the photographs. Israeli intelligence and United States intelligence had previously secretly agreed to cooperate on security matters. James Jesus Angleton was the Central Intelligence Agency's (CIA) head of counterintelligence and in charge of the clandestine liaison with Israeli intelligence. The photographs were delivered to him. On 17 April 1956, the photographs reached the CIA chief Allen Dulles, who quickly informed U.S. President Dwight D. Eisenhower. After determining that the speech was authentic, the CIA leaked the speech to The New York Times in early June. While Khrushchev was not hesitant to point out the flaws in Stalinist practice in regard to the purges of the army and Party and the management of the Great Patriotic War (i.e., the USSR's involvement in World War II), he was very careful to avoid any criticism of Stalin's industrialization policy or Communist Party ideology. Khrushchev was a staunch party man, and he lauded Leninism and Communist ideology in his speech as often as he condemned Stalin's actions. Stalin, Khrushchev argued, was the primary victim of the deleterious effect of the cult of personality, which had, through his existing flaws, transformed him from a crucial part of the victories of Lenin into a paranoiac, easily influenced by the "rabid enemy of our party", Lavrentiy Beria. Repression of the majority of Old Bolsheviks and delegates of the XVII Party Congress, most of whom were workers and had joined the Communist Party before 1920. Of the 1,966 delegates, 1,108 were declared "counter-revolutionaries"; 848 were executed, and 98 of 139 members and candidates to the Central Committee were declared "enemies of the people". Examples of repression of some notable Bolsheviks were presented in detail. Stalin ordered that the persecution be enhanced: NKVD is "four years late" in crushing the opposition, according to his principle of "aggravation of class struggle"
Practice of falsifications followed, to cope with "plans" for numbers of enemies to be uncovered. Manifestations of personality cult: songs, city names, etc. On 30 June 1956, the Central Committee of the CPSU issued a resolution titled "On Overcoming the Cult of the Individual and Its Consequences" which served as the party's official and public pronouncement on the Stalin era. Written under the guidance of Mikhail Suslov, it did not mention Khrushchev's specific allegations. "Complaining that Western political circles were exploiting the revelation of Stalin's crimes, the resolution paid tribute to [Stalin's] services" and was relatively guarded in its criticisms of him. Khrushchev's speech was followed by a period of liberalisation known as Khrushchev's Thaw, into the early 1960s. In 1961 the body of Stalin was removed from public view in Lenin's mausoleum and buried in the Kremlin Wall Necropolis. Polish philosopher Leszek Kołakowski criticized Khrushchev in 1978 for failing to make any analysis of the system Stalin presided over. "Stalin had simply been a criminal and a maniac, personally to blame for all the nation's defeats and misfortunes. As to how, and in what social conditions, a bloodthirsty paranoiac could for twenty-five years exercise unlimited despotic power over a country of two hundred million inhabitants, which throughout that period had been blessed with the most progressive and democratic system of government in human history—to this enigma the speech offered no clue whatever. All that was certain was that the Soviet system and the party itself remained impeccably pure and bore no responsibility for the tyrant's atrocities." Western revisionist historians also tended to take a somewhat critical view of the speech. J. Arch Getty commented in 1985 that, "Khrushchev's revelations... are almost entirely self-serving. It is hard to avoid the impression that the revelations had political purposes in Khrushchev's struggle with Molotov, Malenkov, and Kaganovich." Historian Robert W. Thurston similarly argued in 1996 that Khrushchev "had much to gain in the attacks he made on his predecessor" and that neither his attacks on Beria nor his claims in regards to Stalin's involvement in Kirov's death are particularly reliable. A 2011 book titled Khrushchev Lied by American pro-Stalin author Grover Furr takes an even stronger negative view of the speech, dissecting the speech itself directly. According to Furr, all 61 allegations made in Khrushchev's speech "with only one minor exception" were "demonstrably false." However, while critics agree that much in Khrushchev’s speech was false, even knowingly and maliciously false, Furr's book has been criticized for not providing an alternative and for not meeting a sufficient burden of proof in making his own claims. The historian Geoffrey Roberts said Khrushchev's speech became "one of the key texts of western historiography of the Stalin era. But many western historians were sceptical about Khrushchev's efforts to lay all the blame for past communist crimes on Stalin". A number of scholars meticulously listed numerous errors, omissions, hypocrisy, and other problems with the speech. ^ Allen Dulles: The Craft of Intelligence; 1963; p. 80. ^ Francis X. Clines (6 April 1989). "Soviets, After 33 Years, Publish Khrushchev's Anti-Stalin Speech". New York Times. Retrieved 29 February 2016. ^ Ronald Grigor Suny, The Making of the Georgian Nation. Bloomington: Indiana University Press, 1994; pp. 303–305. ^ "1964: On Khrushchov's Phoney Communism and Its Historical Lessons for the World". marxists.org. ^ William Taubman: Khrushchev: The Man and His Era; 2003; Chapter 11. ^ a b c d e Roy Medvedev and Zhores Medvedev, The Unknown Stalin: His Life, Death, and Legacy. Ellen Dahrendorf, trans. Woodstock, NY: Overlook Press, 2004, p. 102. ^ a b c Medvedev and Medvedev, The Unknown Stalin, p. 103. ^ Medvedev and Medvedev, The Unknown Stalin, p. 103-104. ^ a b c Medvedev and Medvedev, The Unknown Stalin, p. 104. ^ The text was published in the magazine Известия ЦК КПСС (Izvestiya CK KPSS; Reports of the Central Committee of the Party), #3, March 1989. ^ John Rettie, "The day Khrushchev denounced Stalin", BBC, 18 February 2006. ^ a b c Melman, Yossi. "Trade secrets", Ha-aretz, 2006. ^ Chamberlain, William Henry. "Khrushchev’s War with Stalin’s Ghost", Russian Review 21, #1, 1962. ^ Khrushchev, Nikita S. "The Secret Speech–On the Cult of Personality", Fordham University Modern History Sourcebook. Accessed 12 September 2007. ^ McClellan, Woodford. Russia: A History of the Soviet Period. Engelwood Cliffs: Prentice-Hall. 1990. p. 239. ^ Kołakowski, Leszek. Main Currents of Marxism: Its Origin, Growth, and Dissolution Vol. III. Oxford: Clarendon Press. 1978. pp. 451-452. ^ Getty, J. Arch. Origins of the Great Purges: The Soviet Communist Party Reconsidered, 1933-1938. New York: Cambridge University Press, 1985. p. 217. ^ Thurston, Robert W. Life and Terror in Stalin's Russia. New Haven: Yale University Press. 1996. p. 22, 118. ^ Sven-Eric Holmstrom (2012). "Book Reviews: Khrushchev Lied". Socialism and Democracy. 26 (2): 120. doi:10.1080/08854300.2012.686278. ^ "Khrushchev Lied But What Is the Truth?". Retrieved 28 March 2017. ^ Geoffrey Roberts. Stalin's Wars: From World War to Cold War, 1939-1953. London: Yale University Press. 2006. pp. 3-4.